CATALINA ISLAND — Snorkeling in the waters of Toyon Bay Oct. 13, Jasmine Santana was headed past the pier for a relaxing swim. She expected to see fish. What she didn’t expect was the glimmering blue half-dollar-size iridescent eye she saw staring at her from the sandy bottom. Right then and there, the Catalina Island Marine Institute (CIMI) instructor knew that her plans for the day had changed. At first, Santana approached carefully. “When I first saw it, I was a little scared because it was so big. When I got closer, I saw that it wasn’t moving,” she said. That’s when she realized it was dead. With the body being almost perfectly intact, it appeared to have died of natural causes. “I’d never seen anything like it,” she said. Santana swam around the 18-foot serpent-like body and realized what she’d found. “Once I saw the beautiful red dorsal fins on its head, I knew it was an oarfish,” she said. She remembered a video that her coworker had showed her on ribbon fish, a smaller relative of the oarfish, months earlier. Considering how rare this animal was, Santana knew she had to take it with her. As she reached the ocean’s surface, she looked around, searching for a landmark to remember. She figured she was about 20 feet away from the last pillar of the pier. Santana headed to shore, grabbed a pair of gloves — in case the fish was diseased — and put on some diving weights. She swam back out, dove down and attempted to lift the giant fish, grabbing the head with both hands. “That was impossible, it didn’t move,” Santana recalled. After rising to take a breath, she went for the tail, pushing off the sea floor as she tried to surface the animal. The oarfish head floated up, coiled and hit the swimmer square in the back. She pushed the dead mass away, straightening the creature behind her, raised the tail over one shoulder, and swam for shore. When co-worker Jeff Chace and other instructors got out to the surf line to help Santana, they realized what she had said. 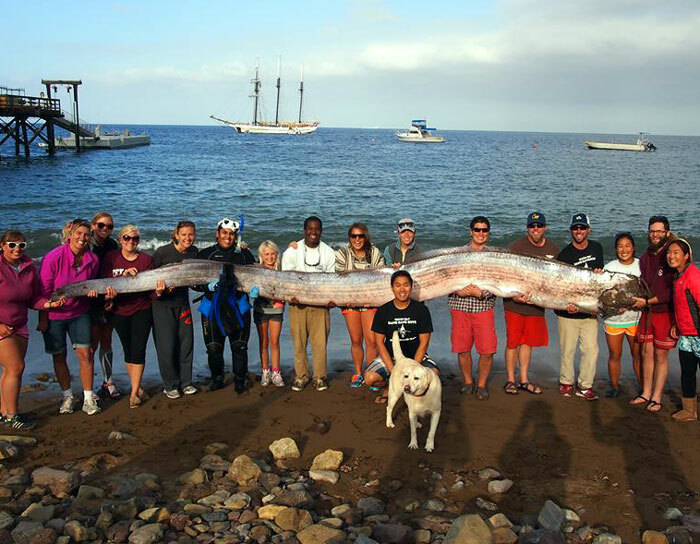 It took 15 people to pull the oarfish onto the shore and over to the amphitheater. Once there, the group covered the fish with a tarp and coated it with ice. “We iced it because we were going to have kids (here) on Monday. We wanted to preserve it so they could check it out,” Chace said. Because CIMI, founded by marine biologists in 1979, is an institution and camp dedicated to providing hands-on methods for children to learn about marine biology, instructors placed the oarfish in a ditch next to their lab, where they could show their find to about 200 children. Unlike what conjures from a child’s imagination, instructors showed students just how real this animal is. Santana also explained to the students how the rare fish actually lies vertically in the water, not horizontally — and that it has a gelatinous body. Instructors plan to exhibit the oarfish for one more day before dissecting the body.